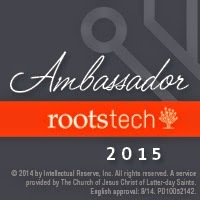 After my unsuccessful attempt to get to RootsTech 2014 earlier this year, I am pleased to announce that I fully intend to be at RootsTech 2015 (Feb 12th -14th 2015) and I have been invited to be an Official Ambassador. For those of you who don't know I had to cancel at the last minute in 2014 due to illness. The new role of Official Ambassador reflects the wider variety of media used by such "Ambassadors", who don't just blog, but are active in promoting RootsTech across a range of media, including Blogging. This year, RootsTech is combining with the FGS Conference so I shall expect an even wider selection of talks than in previous years. For anyone who is interested - and maybe still considering attending in person - the current list of RotsTech speaker sessions can be found here, with exact dates and times still to come. The FGS speaker schedule can be found here. However, if you are unable to attend Salt Lake City in person, the main Keynote sessions - as well as some of the smaller ones - will be able for online viewing as in previous years. So watch this space for more reports, both before and during the event itself!